In what seems like forever ago, I started blogging on Chris Pirillo‘s old LockerGnome Blog site. So, I suppose that means that Chris was probably the one who got me started on this addictive, time-consuming, but FUN avocation. Thanks for that, Chris. 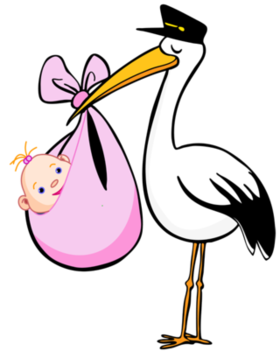 Anyway, the real reason for me posting here today is just to say CONGRATULATIONS to the new mommy and daddy, Diana and Chris P., who very recently had a visit from the stork. Said stork delivered this bundle of joy to the Pirillos. Here’s wishing this young lady a long and very happy life. All the best to mom and dad, too. They’ll have their hands full now. Posted by V. T. Eric Layton on 17 September 2014 in Whatnots and tagged baby, blogging, Chris Pirillo, Congratulations, Diana Pirillo, Lockergnome, stork.